I needed a new wreath this year because my old one was falling apart. It was inexpensive to begin with and I guess 6 years was all it had in it. But, my budget for a new wreath this year was pretty much nonexistant. 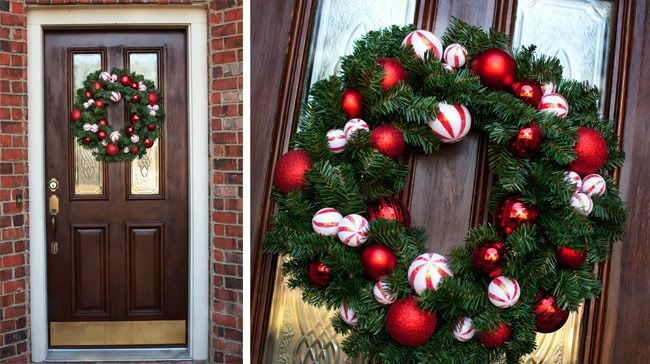 And wouldn't you know, I saw a wreath I loved in the Pottery Barn catalog...for $79 plus shipping. Not a terrible price for a wreath you will use for several years, but it just wasn't for me this year. But I immediately thought that I might be able to duplicate the look for a lot less. 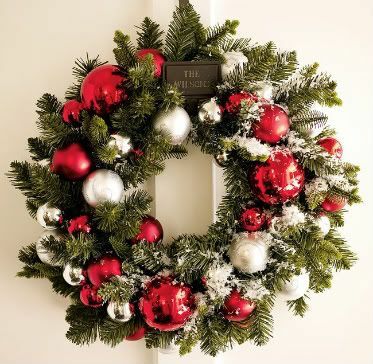 The Pottery Barn Wreath. It's pretty, isn't it? I bought a wreath at Michael's for $5, some ornament balls at Hobby Lobby for $15, and some wire at Lowes for $3. So, for about $23 and an hour of my time, I got a Pottery Barn wreath look-alike. Obviously it's not exactly the same, but I was happy with the results. I started out by placing the largest balls on the wreath, spacing them out in a way that looked pleasing to me. Then I cut some of the wire with wire snips and threaded it through the hole at the top of the ornament where the hook usually goes if you are hanging it on a tree. Then I wrapped the wire around the back of my wreath and twisted it tightly to hold the ornament in place. I repeated that same process for each kind/size of my ornament balls until I was satisfied that there were enough on there. I wanted it to be fairly simple so I didn't add a bow or ribbon, although I think it could look nice hanging from a nice ribbon. The cool thing about this project is that you can tailor it to the colors you use in your Christmas decorating or even change some of the balls out from year to year since they are not attached with glue. I LOVE it! We did something similar at our house. I saw in Southern Living a home that had a wreathe at every front window and loved the look. So I waited until 50% off day at Garden Ridge and bought 5. Then I bought one giant red ribbon for each. So for $40, I have a simple wreathe outside on every window! You should see the christmas tree! i think i prefer yours to the pottery barn wreath- very pretty! You did a great job, Rachel! Love it! That's really pretty, Rachel.